Whether you are remodelling your home for a special purpose, or you just want to get rid of the old to make room for newer furnishings and design ideas, take your time to consider all your options. Because a home renovation project can easily get financially out of control, as there are many wonderful bathroom and kitchen cabinets and sink counters to choose from. So, it is recommended to consult with a registered building practitioner because they can help you budget ‘exactly’ how much you will spend. While most contractors will give you a rough estimate for a home renovation project, the end costs usually surpass the stated ‘original’ amount. This is not the case when you work with Concept Bathrooms because we never exceed our estimated costs. Instead, we look for ways to save our customers money because we understand what it is like to be on a budget. However, that doesn’t mean you can’t afford to renovate your bathroom or kitchen, you can, and we are happy to show you how. We have many years of experience in helping property owners renovate on a budget, with great success, especially when they are well-informed and have an idea of what they wish to accomplish. To help, here are some things to consider. Right from our first meeting with clients, we ask them about all the changes they would like to see. Often things get left behind in planning, which is why the end costs are usually higher than originally estimated, but once you have considered everything, it is easier to calculate costs and not stray from the targeted goal. Budget home renovation services are tightly tied to a realistic approach to the whole project. When overspending is a concern, everything from the doorknobs to bolts can save a little money. That is why we make sure that the project stays on track without many changes. Budget home renovation services is ideally a fast-paced process after the planning stage. Contractors want to get it done quickly without any delays, if at all possible. That is why it is extremely important that you avoid any changes once you commit on a decision regarding choice of materials, fixtures and furnishings. 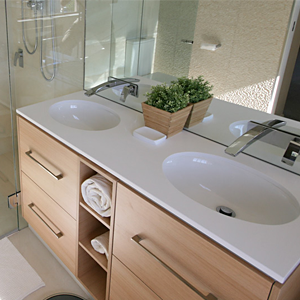 If you have a budget for your bathroom or kitchen renovation project, and you could use a little help saving some money, while staying on track, then we can help you, that is what we do – helping property owners get the most out of their money.